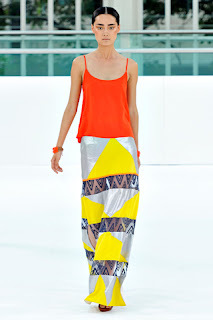 Sass & Bide’s collection was heaps of fun and even more streamlined than usual. Streamlined in as much as fluoro pops of colour, metallic and embellished highlights, dark floral prints and neoprene splashes can ever be regarded as streamlined. However, when Sarah-Jane Clarke and Heidi Middleton’s collection is as luxurious as cashmeres, leathers and suedes in softly structured layers, then this collection was a dream for these seeking difference with a Bohemian tribal edge. The Sass & Bide team stated that they were playing with scale and proportion in this offering and attempted to scale back their legendary luxurious overdose of texture and fabric clashes. Still, the collection stayed true to its rich roots and this West London magpie loved their maximalism in just the right dose. Polka dot highlights paired with red track style pants, sharp biker jackets with metallic skirts and splurges of fluoro jewellery, long flouro print pop-art batik skirts with simple scarlet vest tops all showed daring while being exactly upbeat. The Sass & Bide woman likes having a good time. This is a collection for her to make a splash in. To make a comment on this review please leave a comment in the box below. Thank-you.